We are living in a world where almost everybody is concerned about healthy living and keeping fit. When it comes to physical well-being, cycling is regarded as the best exercise for people of all ages and gender. Studies carried out estimates that almost ¾ of the American population are overweight or obese. Cycling is one of the best exercises that can help you manage your weight while providing you with great adventures. There are so many health benefits that you will get from cycling. But first, you need to have a quality hybrid bike. Selecting a hybrid bike can be tough. It gets even tougher if you are buying a hybrid bike for women. 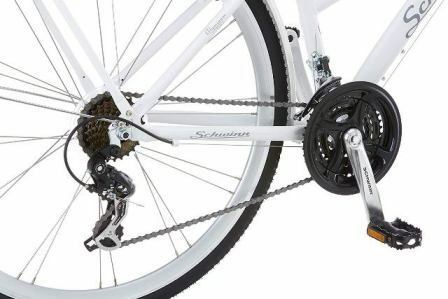 Schwinn Discover Hybrid Bicycle is one of the best bikes that is designed specifically for women. This bike is comfortable and equipped with many features and accessories that make riding fun. I have made this review to provide you with an in-depth understanding so that you can determine whether the bike is worth your investment. This hybrid bike is purposely made to suit the needs of female riders. Let us check some of the outstanding features that make it stand out from many hybrid bikes on the market today. One of the most important factors that you should consider when buying a hybrid bike for women is the frame construction. 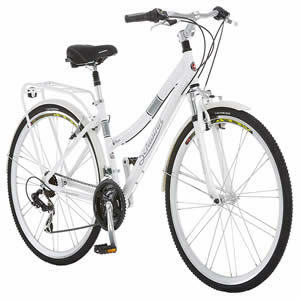 The Schwinn hybrid bike is made with a quality aluminum city frame that is designed to fit a woman's body. The frame is strong and long lasting so you can expect the bike to last for many years. The frame of the bike is made to suit urban riding. If you are a commuter or simply riding for recreation, you will find this hybrid bike very useful. This is a 21-speed women's hybrid bike that comes with quality Shimano twist shifters and Shimano rear derailleurs. The shifters provide precise shifting when you are riding. 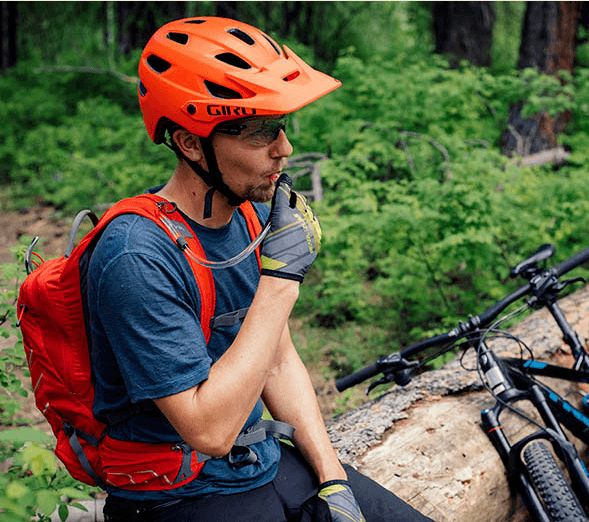 You don't have to worry about finding the right gear regardless of how steep your ride becomes. You can ride uphill and on flats without experiencing any problem. A good hybrid bike should not only provide you with speed but also dependable stopping power. Sometimes you might need to slow down when riding in crowded streets or overcome obstacles along your way. Your safety should always come first when you are on the road. 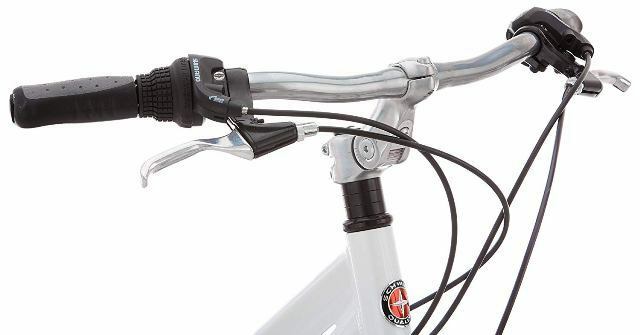 This is why the bike features front and rear linear pull brakes that are easy to use. The brakes respond well in all weather conditions. When you are on the road, the surfaces are not smooth throughout your ride. Sometimes you will experience bumpy and rough terrains which can be uncomfortable if your bike doesn't have a suspension fork. 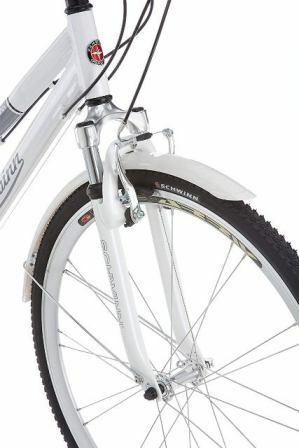 The aluminum frame of this bike features a Schwinn fork that absorbs shock to provide you with smooth rides. It doesn't matter where your rides take you, you can be sure to achieve smooth and comfortable rides. I have tried a wide range of bikes and I know not all bikes are designed with a comfortable seat. This becomes hard when you want to ride over a long distance if the saddle is not comfortable enough. 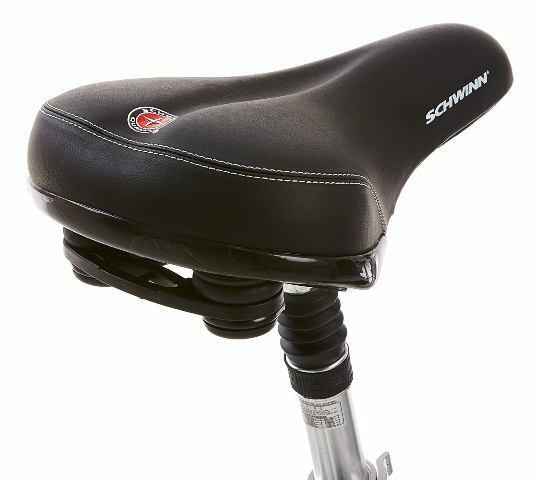 Schwinn has made riding fun by giving you a bike with a padded saddle. 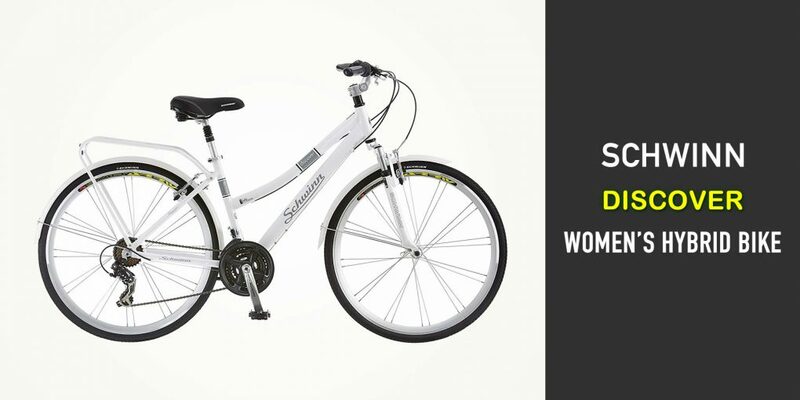 This makes this bike comfortable for women who are commuting or simply riding for leisure. You can cover a long distance while still enjoying very comfortable rides. Love going out shopping? Then you will appreciate having this hybrid bike. It is designed with a rear rack that helps you carry some extra items. If you are picking some groceries or other items, you have a convenient place to keep them. You will also love the fenders that protect you and the bike from mud and sand. A good hybrid bike should provide you with a comfortable riding position to avoid straining your back and other body parts. This is why this bike is designed with a swept-back handlebar design to make riding comfortable. It has an adjustable step that provides you with an upright riding position making the bike comfortable for women to ride. Q: Why do they call this bike a hybrid? A: A hybrid means that the bike has the characteristics of a mountain bike and a road bike. This makes the bike comfortable and fast. A: The bike is designed with an aluminum frame. Q: I am looking for a bike for my wife that is easy to shift. Does this model have shifting problems? A: My wife has this bike and she finds it pretty simple to shift. She says the bike is pretty and provides smooth rides. Q: Can this Schwinn bike fit a woman who is 250 pounds? A: Yes, it can. It supports a total weight of 270 pounds and you should set the tire pressure at 70 PSI to support the weight. 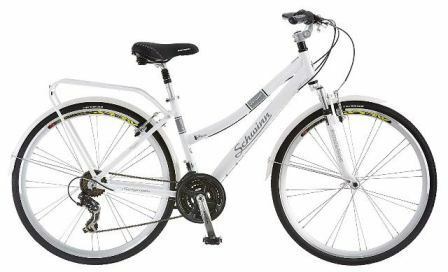 If you are looking for an affordable hybrid bike for women, Schwinn Discover hybrid bike offers an incredible experience. The brand offers quality bikes in terms of material and performance. Not only will you enjoy smooth cycling but also great speed. This hybrid bike is comfortable and fits tall riders well. Considers the comfort, quality, affordability and other features, this is a bike that is worth your investment.